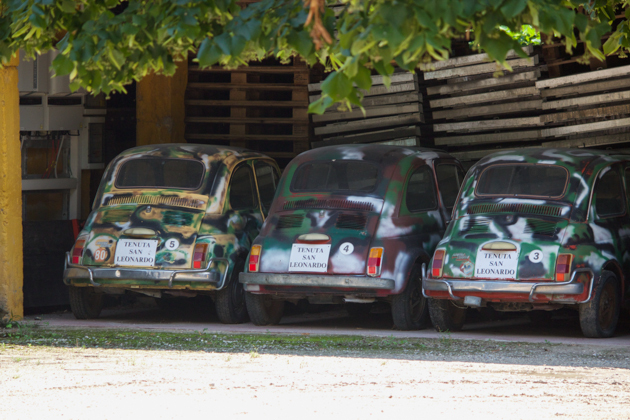 San Leonardo uses largely French grapes and is located in an area not known for fine wine (mainly bulk wine growers using Marzemino and Teroldego vines) but this is not only what makes this winery unique. 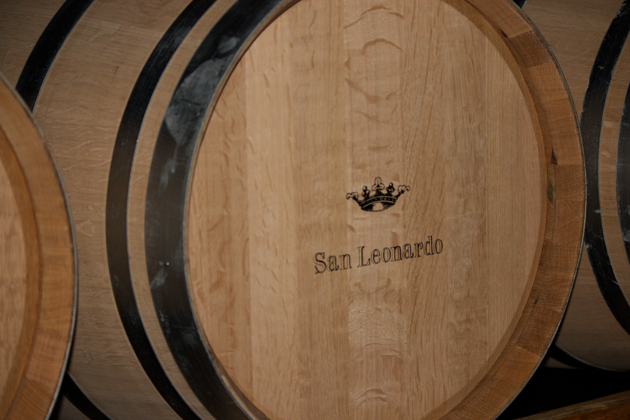 San Leonardo is a very special winery started by crucifer monks (Frati Crociferi) in 1215. Wine had been cultivated here since the Middle Ages. Migrants from France settled here in the 6th century and dedicated a church to Saint Leonard of Noblac. 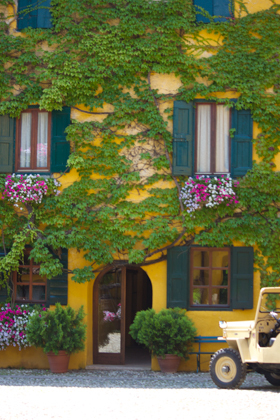 In the early 13th century the monks founded a monastery and hospice and maintained the vineyard. 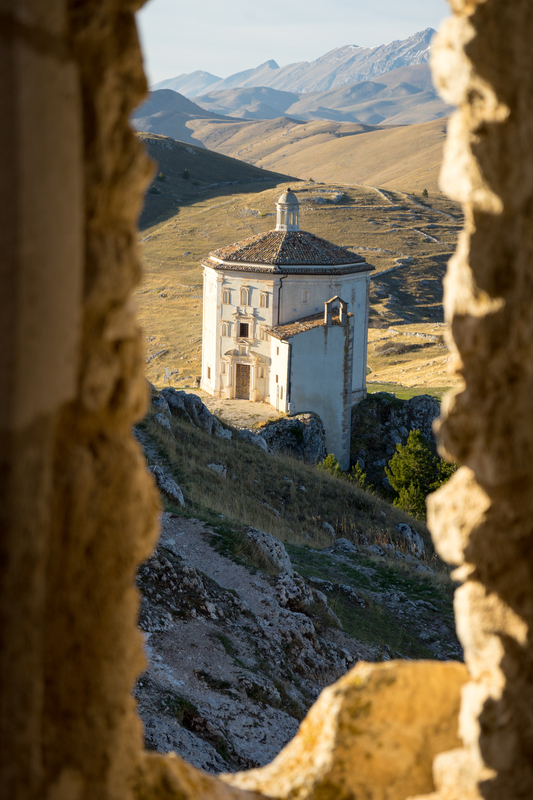 In 1656 the de Gresti’s, a noble family from Trento took over the property and later purchased it in 1724 and built the cellar. 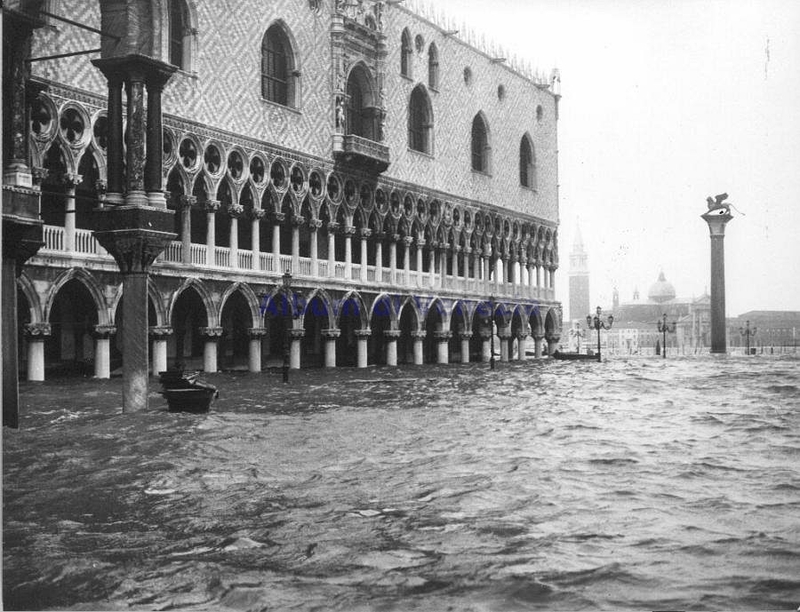 The current owners, the Marquis Carlo Guerrieri Gonzaga and his son Anselmo, are the descendants of the de Gresti and the Guerrieri Gonzaga union by marriage in 1894 (see this link for the family history). They traditionally supplied the Austro-Hungarian empire with their wines. 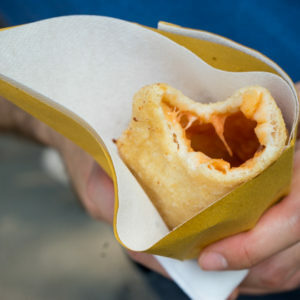 Not unlike the posh food trucks everyone loves in London and New York, upon arriving at San Leonardo, just outside the gate is a small booth labeled “Botte” where one can try San Leonardo wines (maybe the next urban trend?). However quaint the entrance, the estate itself carries an air of gravitas, this is the weight of history. 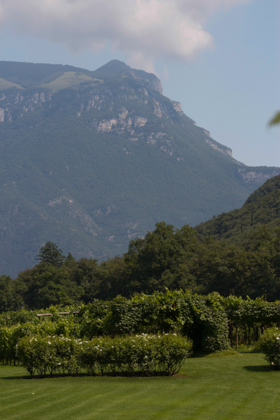 The air feels different and the imposing cliffs of the Dolomites serve as a dramatic backdrop to the rows of vines. 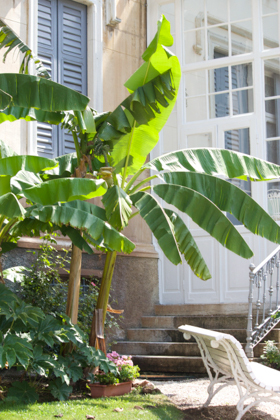 This is where the Alps meets the Mediterranean, creating a microclimate which enables even the growth of normally tropical banana trees. 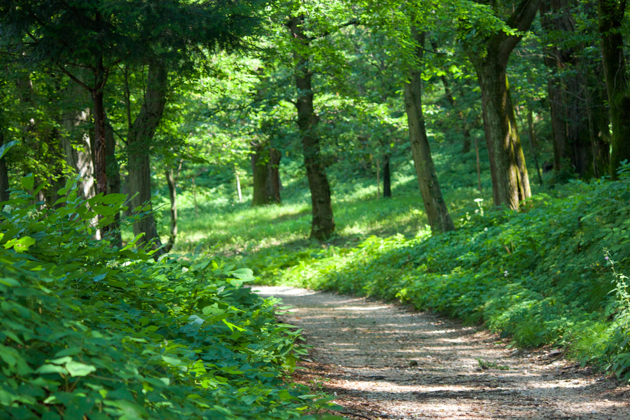 The estate is imbued with history complete with a Roman road leading from Rome to Austria and German weaving through forests on the estate. 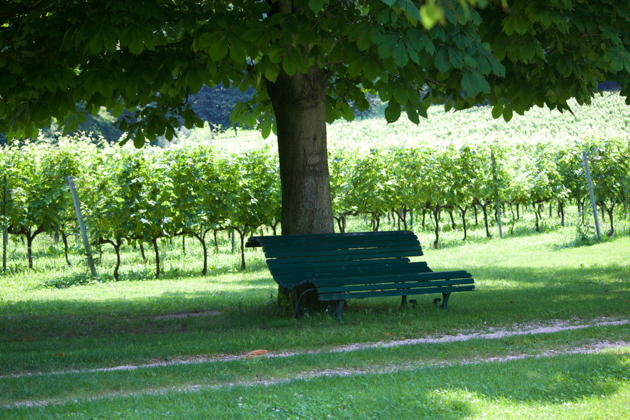 It is fabled that in 588 AD, Authari, the King of the Lombards married Theodelinda, the daughter of the Duke of Bavaria, under a chestnut tree here. 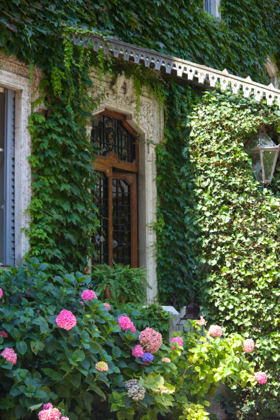 Near the road is a large lawn and tennis courts leading to a beautiful villa, the historic summer home of the Marquis’s family. During the First World War, the front line was in this area and the house was occupied by the 29th regiment of the Italian army. 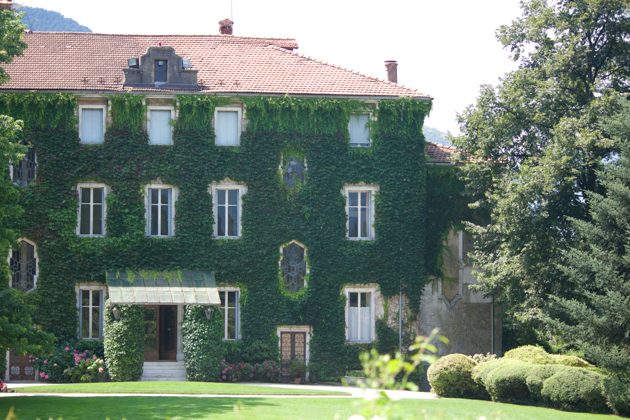 The villa is where they drew up the surrender document for the Austrians to the Italians in 1918 (although it was ultimately signed in Abano Terme), thus ending the First World War for the Italians. In the Second World War, the house was used by the German army for counter espionage and they built barracks in the vineyard. Later the Germans themselves were held prisoner in these barracks. 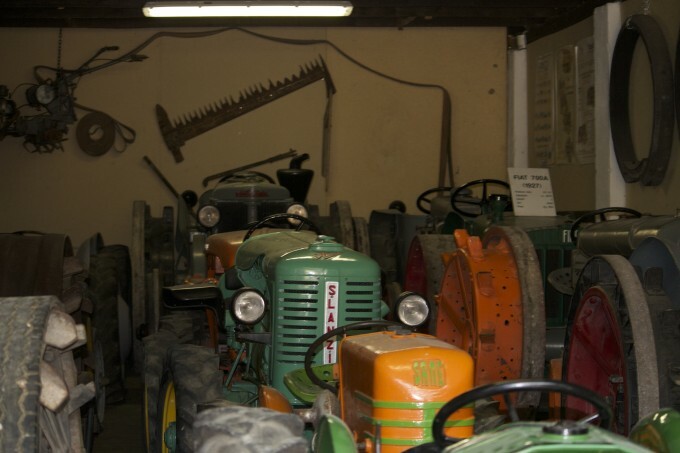 The Guerrieri Gonzaga family diligently preserves the past by maintaining 500 years of agricultural documents and a collection of vintage tractors dating back to the early 20th century. 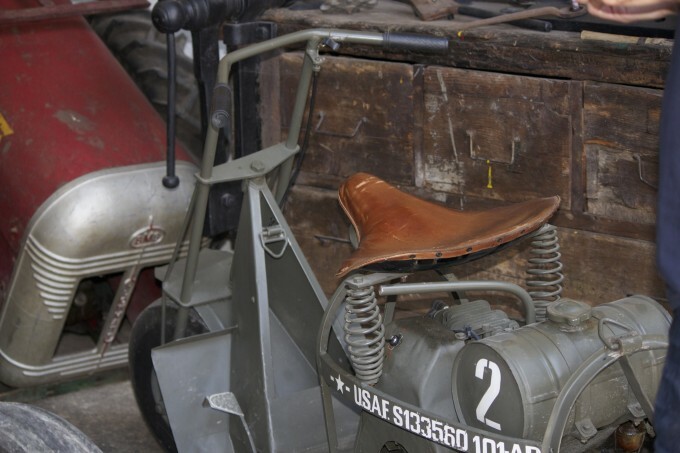 They also have an American military motorcycle which was parachuted in during the war. The museum catalogues the successful efforts of Marchesa Gemma Guerrieri Gonzaga in 1916 to campaign for the repatriation of 12,000 prisoners of war from the Trentino, Trieste, and Istria contingents in the Austro-Hungarian army from concentration camps in Siberia. 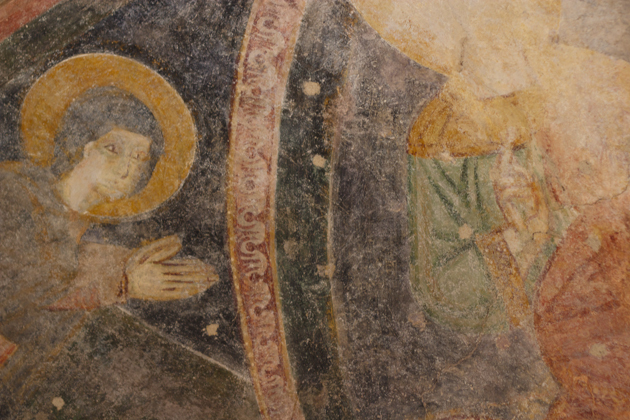 During a renovation, they also discovered a 12th century church with frescoes. The estate covers 300 hectares of which 25 hectares are vines. They produce 250,000 bottles per year. The Cabernet Sauvignon and Carmenère vines grow in pergola style, previously thought best only for quantity rather than good quality wine. 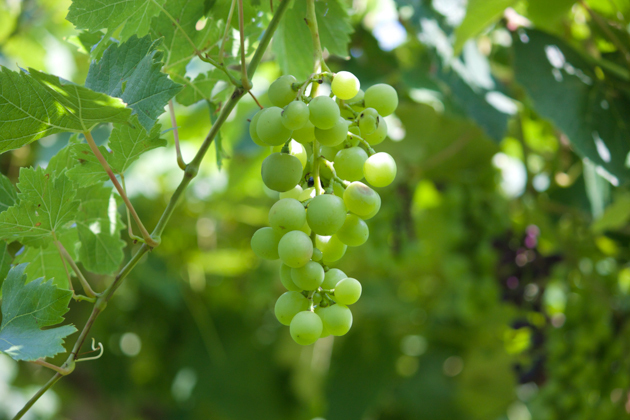 San Leonardo has found that this method suits these grape varieties in certain locations due to soil and sun exposure and with the right pruning (these vines prefer a longer stem). 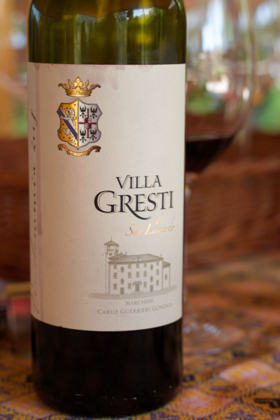 Under Carlo’s management of the estate, the Cabernet Sauvignon varietal and Guyot and spurred cordon trained vines were introduced. 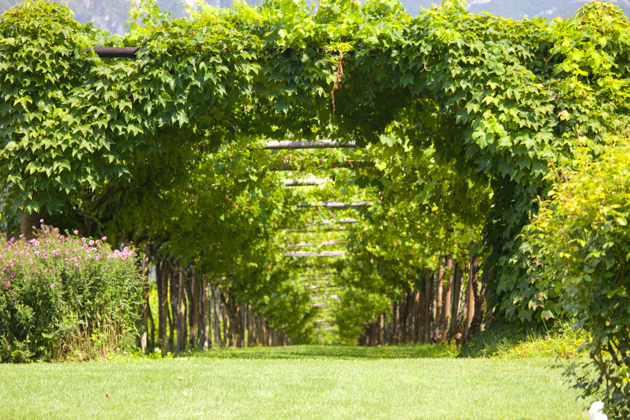 Historically the pergola system was often used to grow vegetables in between the vines but this robbed the vines of too many nutrients and water to create quality wine. 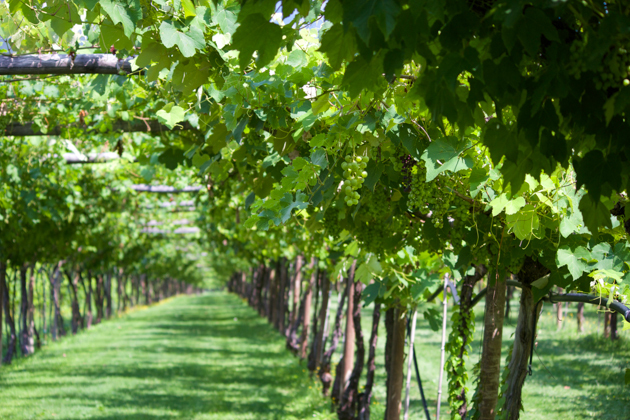 Many producers now grow grass between the vines to give the vines the adequate amount of competition for nutrients and water. 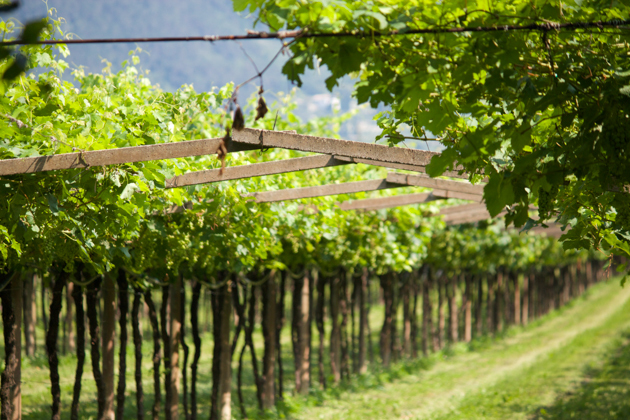 San Leonardo has recently discovered a lawn mower which does not damage the vines allowing them to remove herbicides from their vineyards. The vines are primarily Cabernet Sauvignon, Merlot, Carmenère, Cabernet Franc and Petit Verdot grapes. 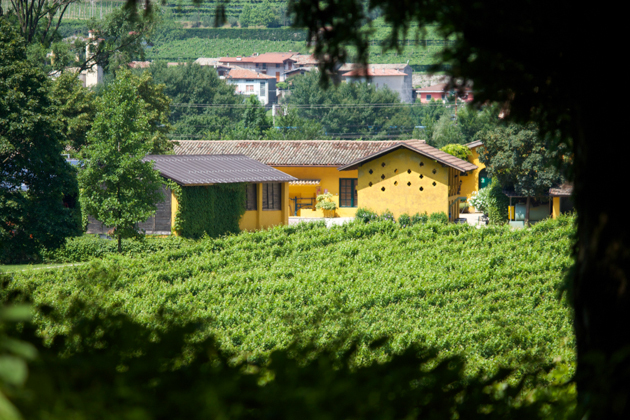 The vineyards in front of the villa are the secret ingredient in San Leonardo, their top wine. They mistakenly thought the 60 year old vines were Cabernet Franc until they ordered more vines from France and they were different. They initially thought they had been sent the wrong varietal until expert analysis determined these are some of the few still existing old Carmenère vines in Europe, the rest having been abandoned due to low yields (despite the often excellent results). The label still states the grape as Cabernet Franc because San Leonardo don’t want their loyal customers to think they have altered their blend. This year they also released a Carmenère cuvée only in magnums which sold out immediately. 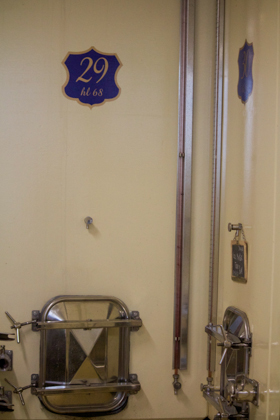 We were struck during our cellar visit, not only by the scenery and history, but by how traditional the winery was. Our surprise was partially due to our knowledge that the Marquis, after finishing a degree in oenology in Lausanne then worked at Sassicaia (a Super Tuscan winery owned by Marchese Incisa della Rocchetta). 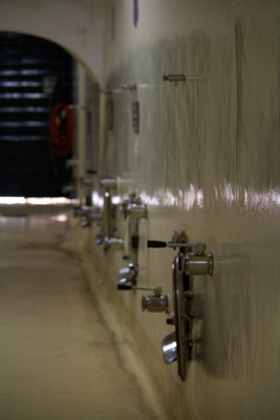 San Leonardo use traditional concrete tanks and age the wine in French oak in their 15th century vaults needing no temperature or humidity control. 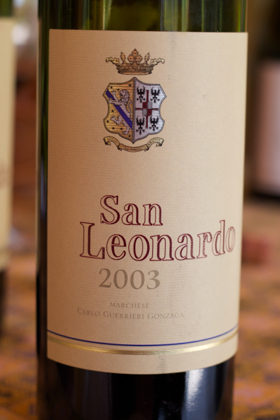 Their top wine, San Leonardo, takes 6 to 7 years to make and is only made in years when the harvest is good. 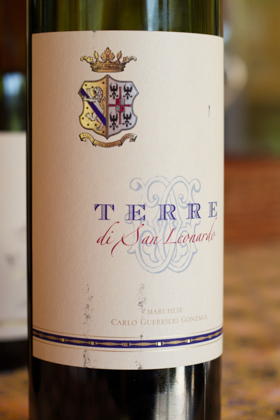 In the years that do not meet the grade, the wine goes into their basic wine, Terre. 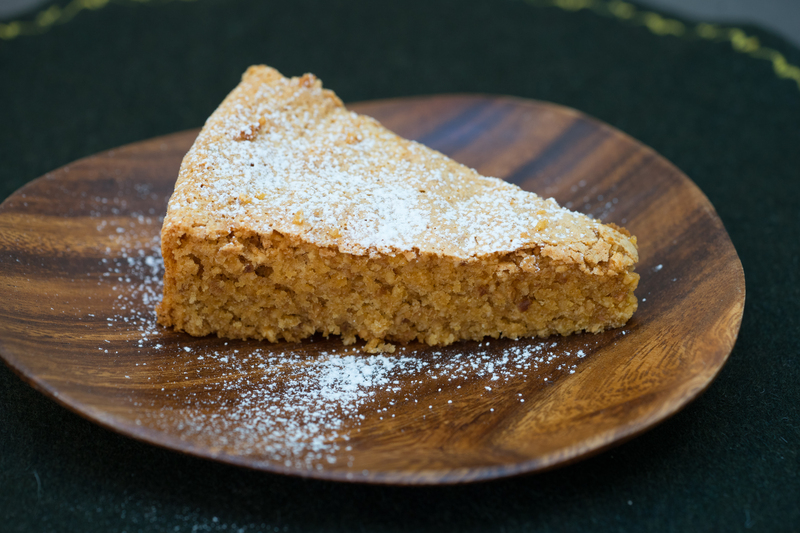 The process for Terre is shorter as it spends 18 months in large Slavonian oak barrels (although up to 20% of the wine has been aged in French oak for at least 6 months). 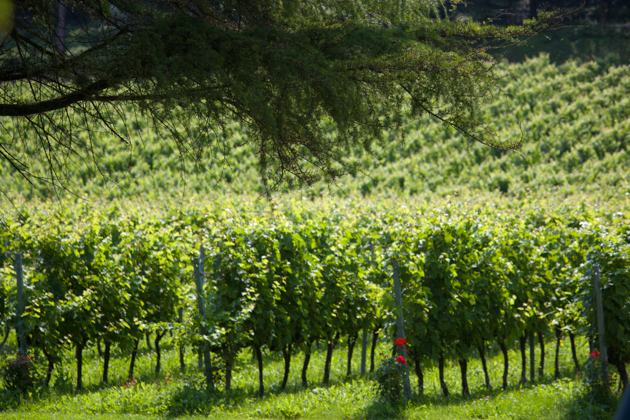 San Leonardo also produces white wine in another vineyard in Alto Adige as well as grappa and honey. Hopefully their success will inspire surrounding wineries to focus on quality over quantity. In the future it may be their only hope of survival due to fierce competition in the new world. Note: Gambero Rosso ratings are out of a maximum of 3 bicchiere. 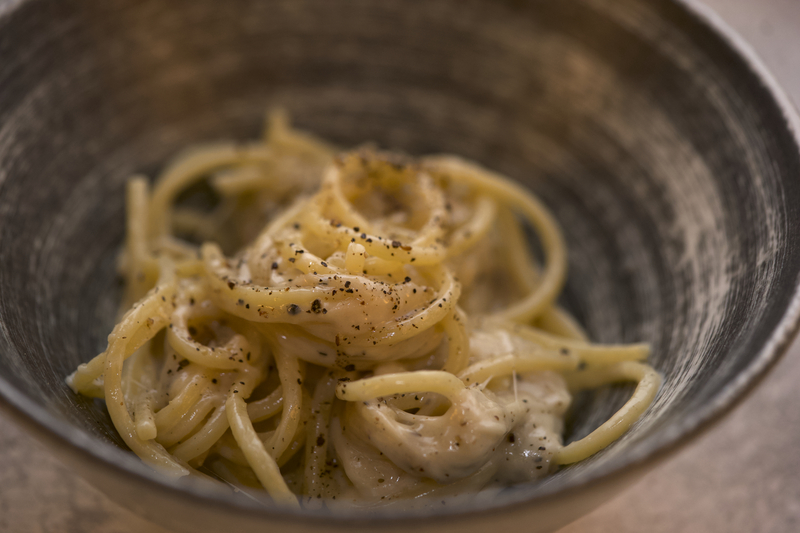 We tried the 2013 vintage which was an elegant wine with fruit, minerality and good acidity. 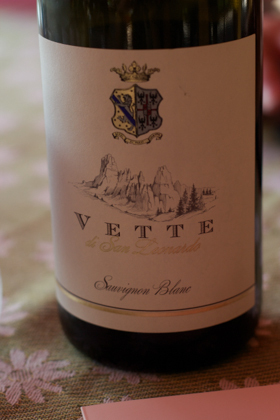 It is made with 100% Sauvignon Blanc and spends 5 months in the tank. It is a new wine, with only 3 previous vintages so far. They produce 70,000 bottles per year. Timing: Drink within 2 years of vintage. We tried the 2011 vintage which we felt was spectacular value for this excellent wine. We bought a case when we got home. It is made with Merlot, Cabernet Sauvignon and Carmenere. It has more fruit and Merlot than San Leonardo. After its barrel maturation (see above) it is aged in the bottle for 6 months. They produce 80,000 bottles a year. Timing: It is ideal drinking time is 6-7 years after vintage but was drinking well when we had it. We tried the 2008 vintage which had good tannins. It is made from Merlot with 10% Carmenere. It is aged in small barrels for 12-14 months and in the bottle for 12 months. They produce 10-20,000 bottles a year. This wine is made with Carmenère grapes from their oldest vines. The wine is aged in barrique for 18-24 months and in the bottle for 3 years. They produce 1,700 bottles per year. We tried the 2007, 2006 and 2003 vintages. The wine was extraordinary, well-balanced with flavours of berries and chocolate. We bought several vintages when we arrived home. 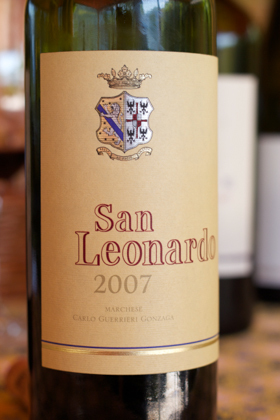 San Leonardo uses Cabernet Sauvignon, Carmenère, Cabernet Franc and Merlot grapes. They produce 70-80,000 bottles a year.